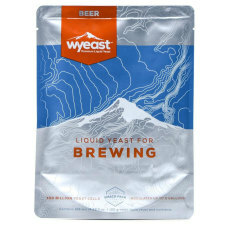 Our liquid yeast selection from Wyeast offers home brewers an amazing amount of unique strains that you just can't find with dry yeast. Expand your brewing options today with a pack from Wyeast! Perfect for our Witless in Indianapolis, this yeast strain purportedly from Hoegaarden is perfect for Blue Moon clones, witbiers, and other spicy Belgian beers. Brew beer like the trappist monks of Belgium! This yeast is a wonderful choice for making delicious, well-attenuated high gravity Belgian beers of all kinds. Roselare Ale yeast is another great choice for Flanders beers and lambics that imparts a distinct sour cherry note to beers. A perfect strain for farmhouse ales and saisons. The classic, yet temperamental, yeast strain for producing Belgian farmhouse ales of superior quality. An excellent strain used in the production of saisons, Biere de Garde, and a range of Belgian ales. Another German wheat strain of yeast that can produce beers with a complex fruit ester profile. A favorite strain in the production of a wide range of Belgian Ales. A blend of different yeasts and bacteria, both domestic and wild, that is the perfect choice for replicating the spontaneous fermentation of traditional Belgian lambic beers. The most widely used German wheat yeast in the world, Weihenstephan Wheat yeast is used to produce classic German wheat beers. Lactobacillus for producing lactic acid, this bacteria culture is used to create a sour character that is integral in certain beer styles, such as Berliner weiss.